Senate Armed Services Committee Chair John McCain (R-Ariz.) criticized President Trump’s announcement on Wednesday that he intends to ban transgender people from the U.S. military. Amid questions about whether transgender people currently serving in the armed forces will be allowed to stay, McCain said his view is they shouldn’t be expelled. McCain stopped short of saying he supports transgender military service, deferring to the review Defense Secretary James Mattis is currently conducting at the Pentagon. 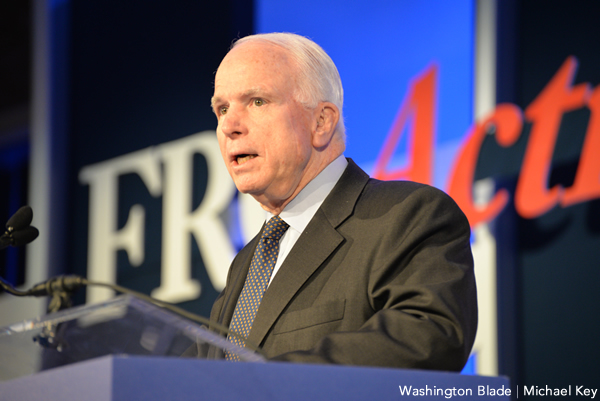 McCain isn’t the only high-ranking Senate Republican to criticize the trans ban. Sen. Orrin Hatch (R-Utah) tweeted out support for transgender people in his state on the day Trump banned them from military service. In a statement to the Washington Blade, Hatch confirmed that tweet was in reference to Trump’s new ban on transgender military service. Hatch and McCain are both among the 10 Senate Republicans in 2013 who voted in favor of the Employment Non-Discrimination Act. However, Hatch insisted on a broad religious exemption in the legislation as well as President Obama’s 2014 executive order barring anti-LGBT workplace discrimination among federal contractors. Hatch got his way on ENDA, although it didn’t make it into law, but not the executive order. The question is are they willing to put their muscle where their mouth is? Would they introduce and promote a bill that expressly allows transgender Americans to serve? THE DEVIL IS IN THE DETAILS. While McCain’s words of support for those transgender currently serving seem to be a positive step, he did NOT say he supports allowing enlistment of further transgender people NOR coverage by the government of any related medical expenses for those currently serving. His statement about wanting to see the results of a new “study” about allowing new enlistments before deciding whether to support them ignores the fact that the RAND Corporation has already studied the subject, finding no reason for concern—AND is a naked contradiction of his preceding assertion, emphasis mine: “any American who wants to serve our country and is able to meet the standards should have the OPPORTUNITY to do so—and should be treated as the patriots they are.” TRANSLATION: classic John McShame talking out of both sides of his mouth. Again.